Well this really is quite an interesting morning in the audio potting shed. Thanks to my good friend Tristan Ofield, I've seen and heard a nice piece of viral marketing for the next Batman film (The Dark Knight Rises). He passed over a link to a piece of audio that is for on the current Dark Knight website, and Tris told me to run it through a spectral analyser, and behold there is a visual message hidden within the spectrogram. #TheFireRises. The audio for the chant essentially all sits below about 5kHz, and ontop of that is the synthesised audio data that reveals itself as words in the spectrogram. This particular band of audio is between 7kHz and 10kHz - completely within the audible spectrum - but plays on the fact that our ears have become so accustomed to bad MP3 (style) compression, that we accept the high frequency warbling that is there the throughout the audio. Just listening to the 7-10kHz band, reminded me somewhat of my old Sinclair Spectrum loading, or a really really bad MP3 style news report. When I originally got the email, I was hoping that it was going to be a bit more cunning, and use something like temporal masking of the text message with the main audio content - that said, it's still a nice trick for this time on a Thursday morning. 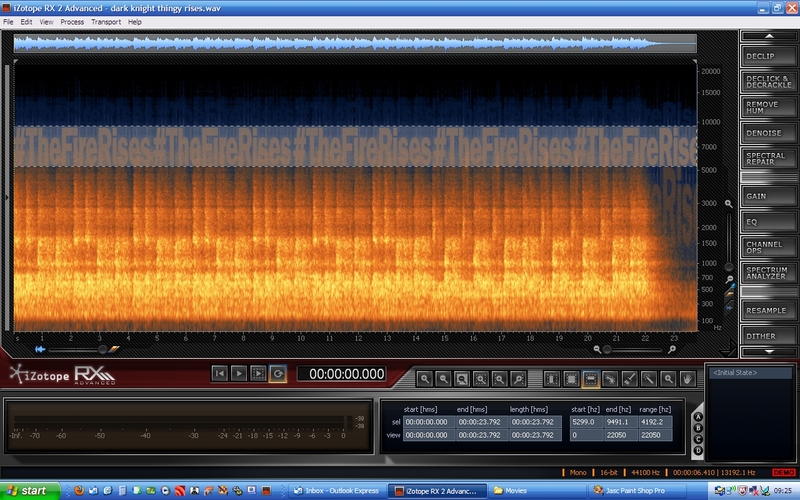 Right at the end of the message, there is a distinct audio shift and the chant fades, and the "text message" drops down into the lower audio frequency range - and you can see on the spectral plot that the message does the same. There have been numberous bits of software in the past that have taken images and generated control functionals for synths - Televonator, JaVoice - and I'm sure there's another that's escaping me - but this is a nice viral application of similar technology - but how many out there will have spectral analaysis software? Until of course, someone post's it in a blog...ahem (cough). Apparently for those that Tweet #TheFireRises (hence the hash tag in the message, and my spurious tweets this morning) are rewarded with a nice picture of the lovely Tom Hardy (top chap, worked with him on Bronson) as Bane. For the link to the full story and final image click here - which I only read after I'd written this entry!! (honest guv').